Happy summer, my wonder-full friends! Here's another of the countless little ways to fully notice and marvel at this glorious season. 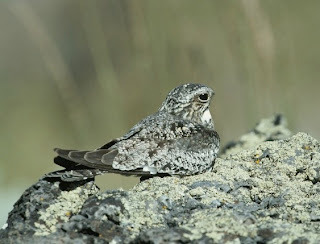 The bird is so common that you can see and hear it almost any warm summer evening nearly anywhere in North America. I’d venture to say that most of us have heard its distinctive cry thousands of times. But it’s so ubiquitous, so enmeshed in the soundscape of a typical summer evening, that few would think to pick it out and explore its source. Granted, this bird is a bit more elusive than the robin or chickadee; you’ll seldom see one up close. But I guarantee that if you make a point of noticing it and take ten minutes to watch it in action you’ll become as enchanted as I am by its incredible aerial dance. My discovery of the common nighthawk began with its voice. I was out for a walk one evening, just before dusk. As I soaked up the luscious air of a summer night and a symphony of people’s laughter, passing cars, distant dog barks, a chorus of crickets and a dozen other sounds, one sound just seemed to jump out at me from all the others. It was a cross between a high-pitched whistle and the breathy “phew!” of relief we humans sometimes emit after doing something strenuous or stressful. Then add a sound like the “ps” in “lips” at the beginning and you've got it: “psssew, psssew”—repeated every few seconds. It was one of those things that, once you notice it for the first time, you can't stop noticing. I just had to figure out what that sound was. Looking up at the twilit sky, I noticed a single jay-sized bird with long pointed wings, each split by a lateral white stripe. It was tracing a broad circle, its wings flopping in an uneven, unhurried rhythm. I’d heard of nighthawks, but knew nothing of their behavior. Still, I knew right away that’s what it had to be. I found a patch of grass, lay down on my back and watched for several minutes. It became clear that the bird’s circular flight path was actually a helix, winding higher and higher with each revolution. Suddenly, it folded its wings back and dove like a falcon. Plummeting right at me, it seemed sure to hit the street. Round and round, up and up it fluttered (“psssew!”). I guessed it was at least a few hundred feet above me when, suddenly, it folded its wings back and dove like a falcon. Plummeting right at me, it seemed sure to hit the street. But finally, just missing the treetops, it pulled sharply out of its dive. 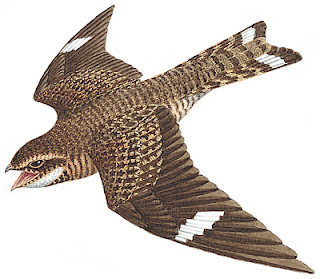 Some evening this summer take a moment to see if you can hear a nighthawk. Then just let your eyes follow your ears, be patient and watch the show. I so enjoyed this post, nighthawks are pretty common out here (southern CA desert), and I do love watching them catch insects right out of the air at dusk. A few years back while excavating some native sites near the Salton Sea (as an archaeologist), it was always part of our day to hear those calls you describe--particularly the "psssew" call--I couldn't help but to "sing those songs" while reading your post LOL! Hey Nature Coach -- thanks for your comment. I'll bet your locale is a great place for bird watching. So glad you appreciate the incredible nighthawk! Jeff, I commend you for being so open to the moment as to not only stop and listen, but to engage so fully as to plop down on the grass to take it all in! You have a real gift in such mindfulness...not to mention your descriptive powers! Thanks for sharing this snippet of your summer!